No interface is needed. Data-collection software included with compatible TI handhelds. The CBR 2™ collects distance, velocity, and acceleration data while connected directly to a TI graphing calculator, so you don’t need a data-collection interface like CBL 2™ or TI-Nspire™ Lab Cradle. The connection to the calculator is through the calculator link port or, if you have any model TI-84 Plus calculator or TI-Nspire handheld the CBR 2 can connect to the calculator’s USB port. Use CBR 2 to teach important concepts in physics, physical science, and math. Engage your students with hand-on activities. Study the motion of a ball tossed in the air, or a cart on a ramp. Attach CBR 2 directly to the Vernier Dynamics Track. The measurement range is 0.15 m to 6 m.
CBR 2 has a sensitivity switch which lets you customize settings to your experiment. The CBR 2 is built with a pivoting head, making it easy to set up experiments. 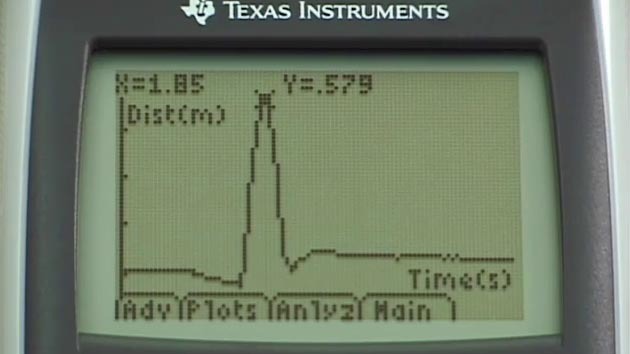 Use a CBR 2 motion detector with a Texas Instruments graphing calculator to collect motion data (distance, velocity, acceleration. * Older versions of the TI SmartView software require a TI Connectivity Cable for data collection with the CBR 2.